isubscribe offers a unique corporate subscription service that can be tailored to meet the specific needs of libraries, schools & public institutions. With a dedicated account manager, isubscribe offers a bespoke service. At isubscribe, we have a dedicated corporate order service, meaning that customers have the ability to buy numerous titles from various publishers through one source, rather than visiting individual publisher sites, saving them time, effort and money. Trying to manage multiple magazine subscription providers? Looking to pay less for the magazines you order? Want to reduce the amount of administration time you're spending? 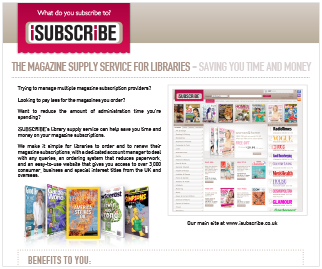 isubscribe’s library supply service can help save you time and money on your magazine subscriptions. We make it simple for libraries to order and to renew magazine subscriptions, with a dedicated account manager to deal with any queries, an ordering system that reduces paperwork, and an easy-to-use website that gives you access to over 3,000 consumer, business and special interest titles from the UK and overseas. We currently supply over 1,000 UK libraries, and our subscription service can be tailored to meet your specific needs. For further information on what we can do for your library, or for a no-obligation quote on your magazine needs, please email hannah.wood@isubscribe.co.uk or call 0207 199 0163. Quotes are provided upon request so you can manage your budget. Save time and money with isubscribe’s schools’ periodical service. Buy the titles your school needs in one place and take advantage of the great discounts available. It’s quick, efficient and helps streamline your purchasing. As the UK’s leading and most comprehensive magazine subscription store, isubscribe gives you access to nearly 3,000 consumer, business, international and specialist titles. We work directly with over 600 publishers, so you need deal only with us for all your magazine requirements. We make it simple for schools to order and to renew magazine subscriptions, with a dedicated account manager to deal with any queries, an ordering system that reduces paperwork, and an easy-to-use website. Contact us today to find out more or to get a no-obligation quote for your school to see how much you might save. For more information please email corporate@isubscribe.co.uk or call 0207 199 0161. We make it easy for you to order or to renew magazine subscriptions, with an account team to deal with any queries, an ordering system that reduces paperwork, and access to over 3,000 consumer, business and special interest titles from the UK and overseas. There are no administration fees and no service charges – and because we work directly with the magazine publishers, you get great special offer prices that save you money off the cover prices of nearly all the titles we supply. And with additional discounts for volume orders, you could make big savings on the magazines you buy. Contact us today to find out more or to get a no-obligation quote to see how much you might save. For more information please email corporate@isubscribe.co.uk or call 0207 199 0161. "We recently began using isubscribe for all of our subscriptions for our salons. It is such a handy service having a one-stop-shop to purchase our magazine subscriptions in one bulk transaction. We used to have to contact many different publishers directly, but iSUBSCRiBE takes care of everything for us, including customer service"
Co-branded variations of card (and box), paper voucher, card & carrier and electronic voucher are available. All of our gifting options are redeemable on any of the thousands of products listed on our site and can be any value. Bespoke designs can also be created. isubscribe can offer you any different combination of media, branding and denomination. It's as easy as 1, 2, 3! We have an array of different gifting options. From emailed vouchers, to paper, plastic and boxed, we can offer you the perfect solution. If you'd like to add your branding to our gift cards, we can offer you a range of solutions. Select any denomination for your gift vouchers.